Delivery-only meal kit services are so 2017. Watch out, Walmart and Weight Watchers — Blue Apron, one of the original meal kit delivery services, is now getting in on the in-store action. The company, which delivers pre-portioned ingredients and recipe boxes to customers' doorsteps via an online subscription, announced Thursday that it will be releasing a line of grab-and-go kits in retail stores. 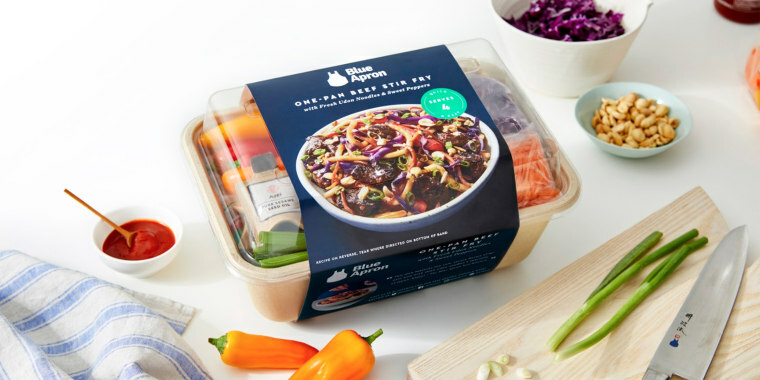 "This offering is part of our strategy to leverage the strength of our brand and the quality of our product to expand to new channels and new consumer segments," a Blue Apron spokesperson said in a statement to TODAY Food. Blue Apron did not provide information on the kit pricing, where they'll be available, the types of meals, or a timeframe for the product launch. So if you really love Blue Apron meals, don't cancel that subscription just yet. The announcement comes amid the company's struggle to retain its edge in a growing landscape of competitors. Amazon rolled out its own brand of delivery boxes (and in-store versions available at Amazon Go locations) in 2017, while both Walmart and Weight Watchers recently revealed lines of meal kits that will be available in grocery stores later this year. Larger grocers like Albertsons and Kroger already offer meal kits from smaller companies in their stores. Due to operational issues, Blue Apron's stock plummeted more than 78 percent since the company went public last June, and its customer count fell 15 percent from 2016. Since then, Blue Apron has tried to entice new subscribers by rolling out programs targeting different diets, including a Whole30 partnership and kits with Mediterranean diet recipes. Blue Apron, which has been in business since 2012, said those new options are "are examples of how we're evolving our core product to address a variety of customer preferences and attitudes."